B. corycaeus specimen with stress patterning. 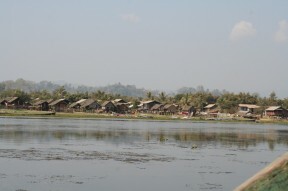 Lake Indawgyi has several settlements around its shoreline. To date the species is known only from the upper Ayeyarwady River basin in northern Myanmar. It has been collected from small streams and tributaries close to the city of Myitkyina in Kachin State as well as in nearby Lake Indawgyi, the largest inland lake in Southeast Asia and home to ten globally threatened bird species. 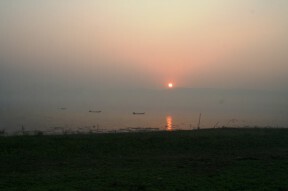 The lake and surrounding area were designated a protected zone by the Ministry of Ecotourism in 1999 and now form the Indawgyi Lake Wildlife Sanctuary. Kachin State itself is one of the world’s great biodiversity hotspots and contains many endemic species although sadly large portions of the area have already been decimated due to illegal logging by both Myanmar and neighbouring China. 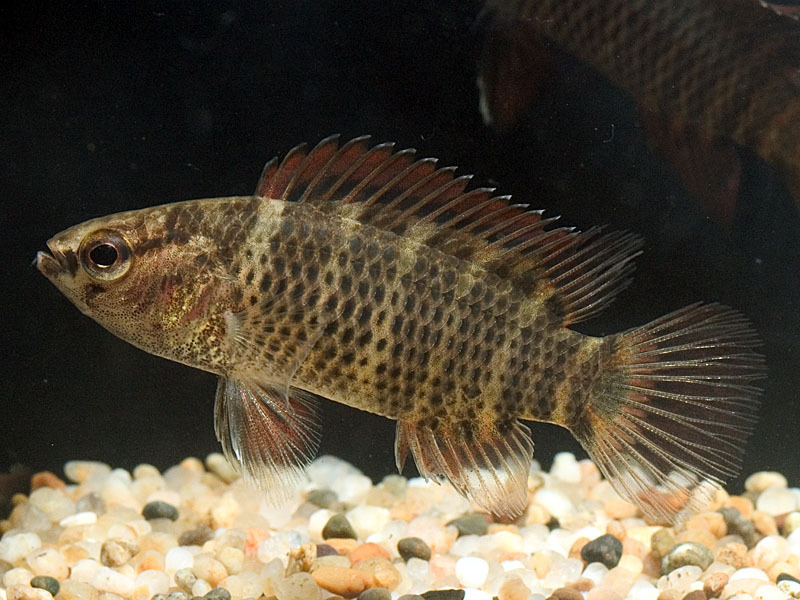 A 2004 phylogenetic study revealed that Badis spp. from the Ganges/Brahmaputra and other Indian drainages were probably separated from the Ayeyarwady populations between 19-23 million years ago. The type locality is a shallow (~ 1m depth during the dry season), clear water stream with a sand and pebble substrate which flows through both secondary forest and agricultural land. The water is described as having a “moderate” current with grassy marginal vegetation and a Cryptocoryne sp. growing submerse. Here B. corycaeus occurs sympatrically with B. kyar and Dario hysginon with the three occupying different ecological niches; B. corycaeus is found in running water towards the margins of the stream, B. kyar in the faster flow towards the centre and D. hysginon only in still pools around the shoreline. A whole host of other fishes were found at this location from Acanthocobitis, Schistura, and Danio to Pillaia, Indostomus and Microphis species. In Lake Indawgyi it occurs only alongside D. hysginon with both species showing a preference for heavily-vegetated marginal zones. The substrate of the lake is a soft, rich clay mixed with high levels of decomposing plant material. Aquatic vegetation and various kinds of algae proliferate including Vallisneria, Elodea and Spirogyra species. According to Kullander and Britz (2002) B. corycaeus is most abundant around the mouth of a southern tributary of the lake named Nant Yen Khan Chaung where there exists a degree of water flow. Around 55 – 60 mm for males, with females a little smaller. B. corycaeus will thrive in a well-structured set-up with a sand or gravel substrate plus plenty of water-worn rocks and pebbles to provide cover. Plant species that can be grown attached to the decor such as Microsorum, Taxiphyllum or Anubias species can be added if you wish but aren’t essential. If you do intend to house it in a community tankmates must be chosen with care. It is slow-moving with a retiring nature and may be intimidated or outcompeted for food by larger/more boisterous tankmates. 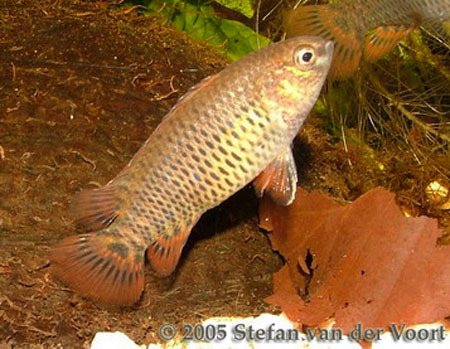 Peaceful cyprinids such as Trigonostigma or Rasbora species are likely to make good choices as are gouramis and other surface-dwelling species. Accommodating it in a biotope-style community of Myanmarese fish is trickier although suitable species from the Ayeyarwady basin include Danio choprae, D. albolineatus, Pethia stoliczkana, and Colisa lalia. Post-spawning the female is ejected and the male takes sole responsibility for the eggs and fry, defending the territory against intruders and fanning the brood with his fins. If you wish the other adult fish can be removed at this point although it is not absolutely necessary yet. The eggs usually hatch in 2-3 days but the fry do not become free swimming until they are 6-8 days old and may not leave the vicinity of the cave for another week or so after that. From then the adults (parent male included) may begin to regard them as food and are best transferred to a separate tank. The young fish are quite sedentary for the first few days meaning microworm is the ideal initial food but once they are visibly swimming in the water column Artemia nauplii can be introduced to the diet. 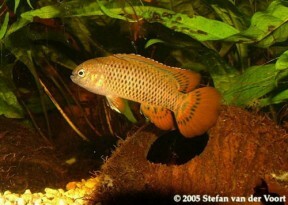 Prior to 2002 the family Badidae included just five species of which only B. badis and, to a lesser extent, Badis dario (referred to as B. bengalensis by some sources) were popular in the aquarium hobby. However an extensive revision paper by Kullander and Britz released that year resulted in the erection of no less than ten new species along with the genus Dario into which B. dario was moved and designated the type species. 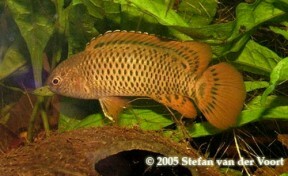 Dario currently contains only three members which are most easily distinguished from Badis by their small adult size (usually less than 1″/2.5cm), predominantly red colouration, extended first few dorsal rays/pectoral fins in males, straight-edged (vs. rounded) caudal fin, lack of visible lateral line and less involved parental behaviour. Badis species now number fifteen with several new ones described recently and others awaiting description. These recent studies have also shown that there exist several groups/clades within the genus, each containing species that are most closely-related to one another. The B. badis group is distinguished only by the cleithral spot and contains B. badis, B. chittagongis, B. dubruensis, B. ferrarisi, B. kanabos and B. tuivaiei. B. ruber, B. siamensis and B. khwae comprise the B. ruber group and are most easily identified by the combination of cleithral spot plus caudal peduncle blotch. The B. assamensis group consists of B. assamensis and B. blosyrus with a unique body pattern of light and dark striping while the B. corycaeus group includes B. corycaeus and B. pyema which possess an ocellated marking at the base of the caudal fin along with a reduction in the number of sensory pores on the head.